Unfortunately Mopar has discontinued the remote start for these model years. Along with the remote start module kit, the remote start installation kit allows you to start your Jeep Wrangler from as far away as 800 feet away, just by pushing a button. 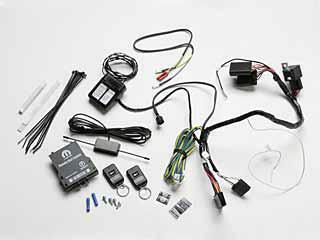 The remote start installation kit includes the specific parts needed to add the remote start module to your model of Jeep. It includes the wiring harness, long-range antenna, key transponder, hood tilt switch, two key fobs, the software cartridge and operating and installation instructions. Order it along with the remote start module kit. is was the easiest remote start to install. The distance of the remote is great , I recommend downloading the PDF. installation file and printing it out follow it page by page as you install ! ConsThe tach pulse wire on a saraha is a diffrent color than explained in the manual.... and one of the tech support guys needs an attitude adjustment ! But I found one who was great and helped me !